This is both an exploit and a guide, I'll start off with the guide portion of this. You have a 31 point Assassin build for "Improved Stealth" and "Slip Away". You have an 8 point Nightblade build for "Lost Hope". Access to the following Instances: "Charmer's Caldera" (in Shimmersand) or "Abyssal Precipice" (in Iron Pine Peak). 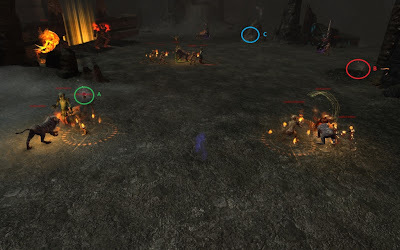 This guide takes from the same concept of old stealth farming methods in World of Warcraft: Sneak around the mobs that can be easily avoided, crowd control those that are in your way. Abyssal Precipice and Charmer's Caldera are the only places to get these three types of materials. I do not have a youtube account, nor any knowledge of video recording/editing so I will use my limited knowledge of taking screenshots and Paint to, well... draw you a picture. Here is my farming rotation for Charmer's Caldera. You will then use "Lost Hope" to ranged CC the second Magma elemental. Point A is an Orichalcum spawn point: Hide behind the rock to mine it. Point B is a Shadethorn spawn point: Stay behind the same rock and gather it. Point C is a Twilight Bloom spawn point: Move behind the rock and gather it, use your Incapacitate if you need to on the raptor closest to it if you're afraid it will aggro you. re-CC the elemental if it comes near you. 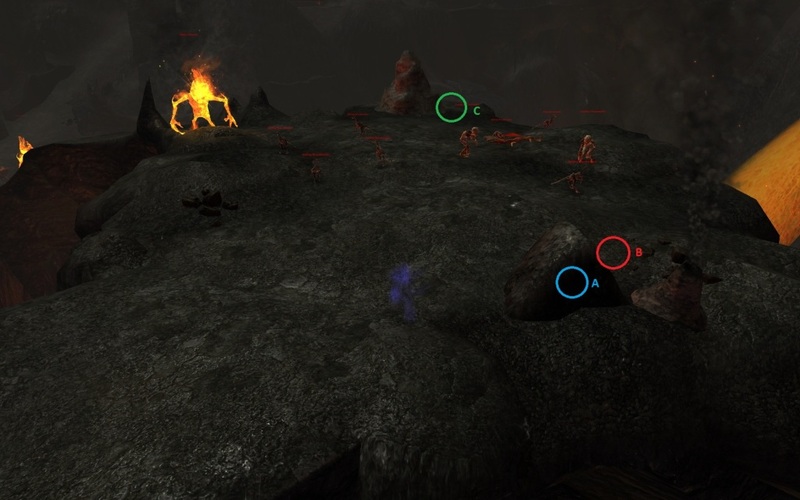 Point A is either a Shadethorn or Twilight Bloom spawn point: Move behind the rock near it to gather it. Point B is a Shadethorn spawn: Move behind the rock to gather it. 1. As long as the hounds and imps are fighting the humanoid mobs, you can walk next to them and gather without any aggro, as long as you stealth up before the humanoid dies. 2. There are two wandering Magma Elementals in this screenshot, be careful. The first is in the top left-hand corner of the screenshot, the next is inside of a wall to the right of Point B. Point A is a Twilight Bloom spawn. As stated, you can walk up next to the mobs and gather it without aggro as long as the humanoid is still alive. Point B is a Shadethorn spawn. 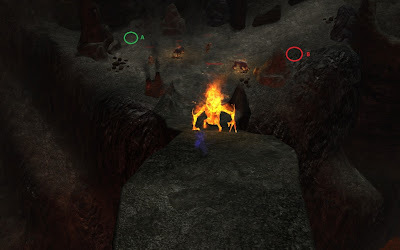 Wait until the Magma Elemental has come out of the way and started to fight the nearest pack of mobs, then gather it. Point C is an Orichalcum spawn. Move to the right side of the rock to gather it. Once that is done, head to the entrance, zone out and reset. Rinse, repeat. Use Slip Away to vanish anytime you might get aggro. You may ask yourself, "Where is the exploit?". After 5 resets you will get the following message. "Cannot reset your map instances yet." At this point, log your character out to the character selection screen and log back in. Voila! You then right click to reset your instance and your instance resets will go back to 5 until you have to do it again. Enjoy your farming, as this will be fixed in the first patch coming out soon. They are going to make it so all gathering nodes spawn passed the first bosses in these two dungeons, which are blocked off by invisible walls.